You will be spinning up a single Google Compute Engine VM instance which can incur real, although usually minimal, costs. Pay attention to the pricing on the account. If you don't already have a Google Cloud Platform account you can sign up for a free trial and get $300 of free credit which is way more than you'll need in this tutorial. A default project is often set up by default for brand new accounts, but you will start by creating a brand new project to keep this separate and easy to tear down later. After creating it be sure to copy down the project id as it is usually different then the project name. Next, set up a service account key which Terraform will use to create and manage resources in your Google Cloud Platform project. Go to the create service account key page. Select the default service account or create a new one, select JSON as the key type and hit Create. This downloads a JSON file with all the credentials that will be needed for Terraform to manage the resources. This file should be located in a secure place for production projects, but for this example move the downloaded JSON file to the project directory. Create a new directory for the project to live and create a main.tf file for the Terraform config. The contents of this file describe all of the Google Cloud Platform resources which will be used in the project. Set the project id from the first step to the project property and point the credentials section to the file that was downloaded in the last step. The provider “google” line indicates that you are using the Google Cloud Terraform provider and at this point you can run terraform init to download the latest version o the provider and build the .terraform directory. * provider.google: version = "~> 1.16"
metadata_startup_script = "sudo apt-get update; sudo apt-get install -yq build-essential python-pip rsync; pip install flask"
The random_id Terraform plugin allows you to create a somewhat random instance name that still complies Google Cloud Platform's instance naming requirements but requires an additional plugin. To download and install the extra plugin run terraform init again. Now it's time to run terraform apply and Terraform will call Google Cloud Platform apis to set up the new instance! Check the VM Instances page in the Google Cloud Platform UI and the new instance will be there. 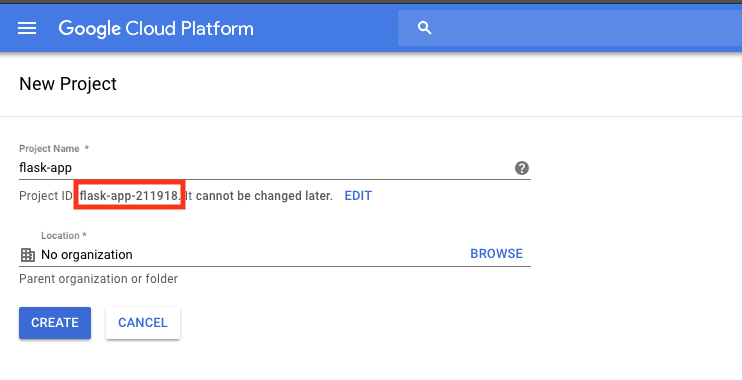 There is now a new instance running in Google Cloud Platform so your next steps are getting a web application created, deployed to the instance and exposing an endpoint for consumption. You will need to add a public ssh key to the Google Cloud Engine instance to access and manage it. Add the local location of your public key to the google_compute_instace metadata in main.tf to add your ssh key to the instance. More information on managing ssh keys is available here. Be sure to replace INSERT_USERNAME with your username and then run terraform plan and verify the output looks correct. If it does run terraform apply to apply the changes. Run terraform apply followed by terraform output ip to return the instance's external ip address. Validate that everything is set up correctly at this point by ssh'ing to that ip address. Flask serves traffic on localhost:5000 by default. Run curl in a separate ssh instance to confirm that your greeting is being returned, however to hit this from your local computer you must expose port 5000. Google Cloud Platform allows for opening ports to traffic via firewall policies, which can also be managed in your Terraform config. Add the following to the config and proceed to run plan/apply to create the firewall rule. Congratulations, you can now point your browser to the instance's ip address and port 5000 and see your server running!